A DEVICE based on a technology used in superfast trains can now be used to test the fat content of milk and cheese. The device that uses magnetic levitation can also be used to test adulteration of vegetable oil. The density of a substance provides the key information about its composition, for instance, the sugar content of soft drinks, the carbohydrate content in a rice grain or adulterants present in vegetable oils. Most existing devices for determining density, such as chromatography and spectroscopy, can be deployed only in labs and are expensive. Scientists from Harvard University in USA have developed an easy-to-use device using maglev. As the name suggests, maglev is the process of suspending an object in air using magnets. When the like poles of a magnet are placed facing each other, they exert a strong repulsive force which keeps them apart. The repulsion can counter the gravitational force and keep the object suspended in air. The scientists used the technology to suspend solid or liquid samples to measure their density. About 10 cm long, the device consists of a glass or plastic container filled with paramagnetic solution with magnets at each end. The solution creates a base to exert magnetic force on the sample in it. Since the magnetic field cancels out the gravity, the sample stabilizes at a height proportional to its density; the lighter it is the higher it moves in the solution. 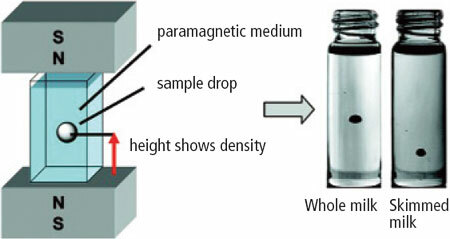 The height is correlated with the ideal density of the substance to evaluate the difference in composition. Writing in the Journal of Agriculture and Food Chemistry in May, lead researcher George M Whitesides said maglev can be used to analyze solids, liquids and colloidal suspensions over a broad range of densities. Besides, it is inexpensive: the device would cost less than US $45 and the paramagnetic solution costs about US 5 cents per test.